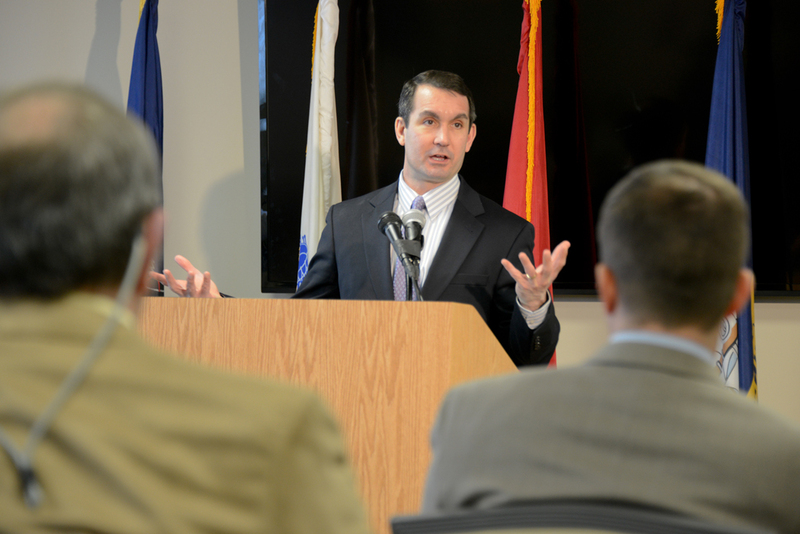 Auditor General Eugene DePasquale announced Thursday that he and his staff have started taking measures to perform an audit on the Pittsburgh Water and Sewer Authority. After a water scare Feb. 1 and months of speculation over lead in the Pittsburgh water system, Mayor Bill Peduto requested Feb. 3 that DePasquale lead an investigation into the PWSA, because he’s a Pittsburgh outsider. DePasquale and City of Pittsburgh Controller Michael Lamb outlined plans for how the audit could identify problems within PWSA and potential solutions at a press conference Thursday morning at the Office of City Controller. In light of this announcement, Lamb released his most recent routine audit of PWSA, which took place from 2012 to 2016. He said this audit is a draft because the PSWA has not responded to the proposed recommendations yet. “With the Auditor General being asked to come in and take a look at some of the newer issues that have arisen, we wanted to make this information available to him — to help him for what he was doing — and since we are releasing it to him, we thought we should release it to the public as well,” Lamb said at the press conference. DePasquale’s audit will first focus on PWSA’s current governance structure and decision-making process. He will review the PWSA from 2014 through an undecided date later this year. “Every resident and business owner here has lived through the problems, and City Controller Michael Lamb is providing extensive recommendations to address what happened,” DePasquale said. PWSA Board Chairman Alex Thomson also released a statement Thursday stating the PWSA Board of Directors and Executive Team are reviewing Lamb’s findings and taking the appropriate actions for improvement. He also said they are prepared to accommodate DePasquale and his staff when they conduct an audit. In Lamb’s audit, he gives reasons for the water issues that have plagued locals for the past year — including high water bills and lead levels in the drinking water. In terms of lead, the report highlighted that while the water leaves the PWSA water treatment plants with no lead, lead can infiltrate the water when it is being transported from main lines and services lines to Pittsburgh homes. One of Lamb’s main concerns was that PWSA does not have an inventory of all the main lines and services lines that contain lead, but PWSA has stated its plans to release an interactive map of this information during the summer. The Environmental Protection Agency established the Lead and Copper Rule in 1991 which calls for water providers to monitor corrosion treatment to meet regulation standards. Because of this, the PWSA started to use soda ash — otherwise known as sodium carbonate — in 1995 to control corrosion in the water lines. They previously got permission from the Pennsylvania Department of Environmental Protection to use the soda ash. However, the PWSA switched from soda ash to caustic soda — otherwise known as sodium hydroxide — in 2014 because it was a cheaper option. What the PWSA didn’t do was notify the Pennsylvania DEP of the change. During the time of the change, PWSA was under the management of Veolia Water North America, a national water management company. Veolia notably made headlines and was blamed for the lead problems in Flint, Michigan. Because Veolia was responsible for the change to caustic ash in Pittsburgh and did not notify the Pennsylvania DEP, PWSA filed a $12.5 million lawsuit against the company in October 2016. Now PWSA manages its own water and is not partnered with another water corporation. When PWSA sent 100 water samples from households across the city to the Pennsylvania DEP for inspection in July 2016, 17 percent of homes failed the water test, although it is uncertain if this change in corrosion control treatment directly caused a spike in the water’s lead levels. Since then, the PWSA has started initiatives to educate people on the issue by providing and encouraging customers to test their water with free lead tests. While lead still remains a concern for local residents, other problems were also highlighted in Lamb’s audit — from how to keep consistent management to providing more efficient customer service. “A perfect storm of mistakes and incompetence [caused the issues for the PWSA],” Lamb said in Thursday’s press conference with DePasquale. Now that Lamb has identified these mistakes, DePasquale wants to look at what could have caused them, and how to prevent them in the future.